Data slides fail in a good scientific presentation if simply copied directly from the scientific paper. A graphic representation is more easy to interpret and remember than many words either spoken or written. Or more succinctly, “Use a picture. It’s worth a thousand words.” Data slides must be easily interpreted, memorable and clear. Few are. Most could be improved. As in much “wisdom” about presentations, particularly scientific presentations, justification for old fashioned practice is usually retro-fitted to justify bad habits and basically excuses. The purpose of a scientific presentation is effective communication. It is not an opportunity for the audience to undertake an analysis of the data and make their own conclusions but to understand how the presenter has come to their own conclusion. It is not necessary to present all the data of the study merely the pertinent data. The first premise of this argument is that a presentation is not a spoken representation of the written document. They are entirely different. A written document allows time for reflection, cross referencing, studying tables, reviewing study groups, undertaking mathematical and statistical assessment and many more tasks all in a period of unconstrained time with opportunities for repetition, review and more. A presentation is linear, time constrained and for a completely different purpose. The two must be constructed in entirely separate manners for entirely separate audiences. One cannot be transformed into the other. They are different. The data slides fail in a presentation if taken directly from the table in a scientific paper. They will not be immediately interpretable. It is unlikely they will be legible for the majority of the audience. They are highly likely to be monochromatic. Meaning may not be immediately obvious. It will distract the audience from the speaker’s delivery in an already time constrained period. It will not be effective. It is designed to stand alone rather than be supportive media (p2) and this adds multiple layers of complexity. A data slide in a presentation cannot simply be the table from the scientific document. 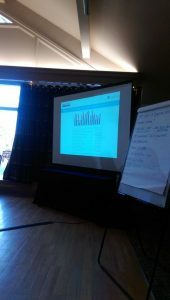 Subsequent posts will discuss how to improve data slides.